The latest installment of Raging Swan press’ handy collections of statblocks clocks in at 19 pages, 1 page front cover, 1 page advertisement, 1 page editorial/ToC, 1 page advice on reading statblocks for novice GMs, 1 page SRD, 1 page back cover, leaving us with 13 pages of content, so let’s take a look! 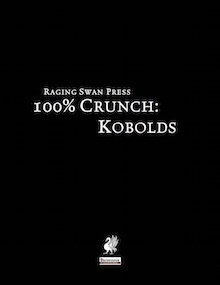 Well, first of all, the pdf explains a bit about the basics of kobolds and then goes on to provide a handy list of statblocks by CR – beginning with CR 1/6 for young kobolds and scaling (haha) up to CR 6 for senior kobold inquisitors. The pdf does feature the basic racial stats for kobolds and covers quite a breadth of characters, also sporting kobolds utilizing NPC-classes. Both kobold adepts and noncombatant commoners can be found herein, for example. Similarly, even kobold skeletons or zombies are featured within this little book. Now as for class dispersal, it’s actually beyond what you’d expect – while obviously, the rank-and-file kobolds sport the warrior/adept NPC-classes, we also are introduced to kobold monks, inquisitors and oracles in various degrees of prowess. Furthermore, the pdf actually provides stats for crucial specialists – What about medium-sized giant kobold champions? Bodyguards or mining specialists? Well, there would also be foraging experts and scouts (using the ranger class or multiclassing warrior/expert) and the obvious draconic bloodline sorceror is covered as well. And yes, there are fighters herein. What about a bard using the dragon yapper archetype or a half-dragon (blue) multiclass kobold? Yes, from the common to the weird, this pdf strikes a nice balance between classic kobold tropes. Editing and formatting are very good, though not as perfect as usual for Raging Swan Press – there seems to be an internal inconsistency on whether or not to bold the separating lines that divide the section of the statblocks into attack, defense etc. – some are bold, some aren’t, which looks slightly weird. Artwork-wise, we get cool b/w-artworks and layout adheres to Raging Swan Press’ two-column b/w-standard. The pdf comes fully bookmarked for your convenience and sports two versions, one optimized for the printer and one optimized for screen-use. Julian Neale’s collection of kobold statblocks is precise, diverse and nice, with particularly the specialists (giant kobolds? templates ones? NICE!) rising above the fray. While I was somewhat surprised to not see a lot of rogues herein, I get the decision to instead go via experts etc. and it makes sense to me. All in all, this is an excellent, inexpensive collection of kobold statblocks – and for the low price point, you sure get a lot of work taken off your back. This is enough for me to arrive at a final verdict of 5 stars. You can get these kobold-stats here on OBS and here on d20pfsrd.com’s shop! You can get a subscription and support Raging Swan Press here on their patreon!